What happens when physics class is fun? A 2 kg melon is balanced on your bald uncle’s head. His son, Throckmorton, shoots a 50 g arrow at it with a speed of 30 m/sec. The arrow passes through the melon and emerges with a speed of 18 m/sec. 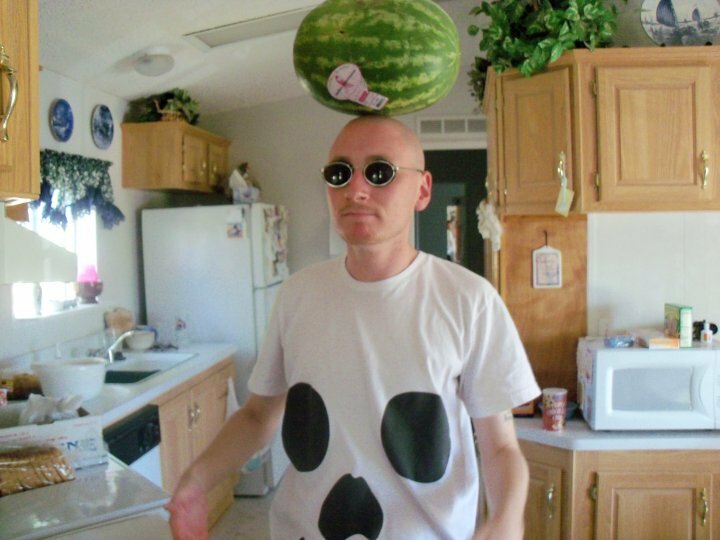 Find the speed of the melon as it flies off the man’s head. There’s a 2-kg (read: Kay-Gee) melon on your bald uncle’s head. and will pierce the right melon if his daddy don’t sneeze. I realize that I need some help with how to proceed to help students discover the principle of momentum in collisions, but before I can adequately explain my problem, I should start at the beginning. I’m trying to refine and improve my technique in building models with students through inquiry so that students can grind their gears on problems that matter and not unimportant details. Before our winter break this year, we started building the Momentum Transfer Model, which, at its start, is really about conservation of momentum. It wasn’t good timing with so little time with which to work. When students watched me collide Cart A (moving) with Cart B (at rest), which would then stick together with Velcro, they suggested various things I could try that might affect the final motion of the carts. They quickly settled on the masses of the two carts and the initial velocity of Cart A. To explore these factors as independent variables, I split students into groups, 1/3 of which were to investigate Cart A’s mass, 1/3 of which were to investigate Cart B’s mass, and 1/3 of which were to investigate Cart A’s initial velocity. As variables go, changing the masses in such a way to keep the total mass constant would be cleaner, but this is hindsight. I wanted to give students a feel for how to gain this kind of hindsight. The groups who experimented with Cart A’s initial velocity had a singularly easy job. They only had to control the variables of the two carts’ masses, and they just pushed Cart A with various speeds and used a motion detector to measure both initial and final velocities. Despite this, some groups didn’t pay attention to whether their data made sense. Some groups had data that showed increasing initial velocities of Cart A but blips where the final velocity of the cars decreased before increasing again. Some groups did notice it, and they rechecked the results until they got something consistent. The groups who experimented with Cart A’s mass also had the second easiest assignment. Despite our shortage of track, they were given an extra piece of track to use as a ramp. Releasing the cart from the same location on the ramp gave their initial velocities an uncertainty of about 2 cm/s. However, even though Cart A’s initial velocity was supposed to be a controlled variable, many students didn’t pay very close attention to it or even try to measure it. Despite this, their data was relatively good. The worst results came from the groups who experimented with Cart B’s mass. Since we lacked enough track to make ramps, we used the spring-loaded plunger on one of the carts to achieve a controlled initial velocity that was uncertain at about the 10% level (maybe 5 cm/s). However, it was easy to have a misfire that would result in a reduced initial velocity. Very few student groups noticed that Cart A’s initial velocity varied wildly in their data. The final tally was that in each of my classes only 1/3 to 1/2 of the data was usable. I would ordinarily send students back to the lab to gather better data. I still may do it, since understanding how to gather data is a more important skill than deriving conservation of momentum from experimental data. However, that’s not what I did. The first day that I realized the data was bad, we just looked at the limiting behavior that we would expect for really small and really large masses. We came up with analogies for each situation, and sketched the graphs. This effectively broke the linear models students fit to their data, but they stared blankly because they hadn’t really gotten that far with their terrible data anyway. Was this useful? I don’t know yet. "helper routine to give cm/sec units from the object's velocity"
The equal mass cases that I suggested were enough to get students to look at the fraction , and it wasn’t too long before they realized that this fraction was the same as , and they made rules that turned out to be . We checked it by making predictions and then trying them to see if they were correct. What was nice is that I didn’t have to tell anyone that their formula was wrong. We just tested it. Here it is, my problem! Here’s what I don’t get. I can turn the above equation for into by careful mathematical steps. I even tried it with one exceptionally clever class who figured it out a day before my other classes, but I think I might have melted their brains. For kids just out of algebra and now in geometry, manipulating equations with six variables seemed like torture. How do I put the focus on the product of mass and velocity as an interesting conserved quantity? How do I go from the simple equation to a deep physical principle? Based on John’s comment below, I wanted to think about the implicit axioms we use in physics when coming up with formulas. Doing so ensures that it will be maximally useful: We don’t have to know what’s going on at two different timer readings to calculate our conserved quantity . Why does this have to be a sum? The formula has to be well-defined independent of our notion of objects, so considering two different objects to be a single object or a single object to be made of two objects shouldn’t change the answer. There are a limited number of ways of doing this. Actually, one could exponentiate both sides to made it a product instead, or if it’s a product, take the logarithm of both sides to make it a sum. where is a function of the mass and velocity. and notice that it has the simple form of the previous equation. When it doesn’t work, what kinds of questions can I ask to focus students on what they are trying? Something interesting happened while teaching this. My students have one-to-one laptops, which I control strictly. Violate rules on when and how to use them, and you lose all privileges to use laptops until you choose to set up a parent-student-teacher meeting to resolve the issues and decide under what conditions to allow you to use it. This policy has worked well, but that’s a different story. It means, however, that I made a small number of paper copies for those who aren’t currently allowed to use their laptops. I taught the students how to use a spreadsheet to enter a formula and test it to see if their formula using the two mass/velocity pairs was conserved (the same before and after the collision). Presumably, students using paper were partly-ignoring me during this spreadsheet review (difference 1). Entering the spreadsheet formula required four steps (two formulas and two fill-downs), taking up a significant portion of working memory (difference 2). Students working with the spreadsheet tended to focus on different kinds of formulas, whereas students working with the paper copy tended to focus more on the actual numbers and use mental math to see patterns (difference 3). The net result was that of the 5%-10% of my class that found the formula in the 30 minutes I gave them—admittedly low, but I decided to go with the time constraint and have this group explain to the rest—around 2/3 were paper users. I like using spreadsheets, but for a task like this, I think paper wins. After pointing out that the masses were conserved (individually and together in this case), I did a Think Aloud and looked at the first two rows of data, in which the sum of the velocities was conserved because the object masses were equal. I used this as my idea, which students could immediately see was wrong if they looked at the third data point. This was how I showed them how to enter a formula in the spreadsheet. Use all four variables , , , in the formula. When adding two quantities, they must have the same units. When multiplying or dividing, it doesn’t matter. We might expect that since it doesn’t matter which we call “A” or “B”, that the formula will be the same if we switch the “A” and “B” parts. I would reveal a new hint when I saw flagging spirits. I was proud that almost all of the students were trying things. Even when it became clear that I was adding hints, they didn’t stop to wait for better hints but kept at it. I was also super proud of the pair of students who worked out the conserved quantity (which violated hints 3 and 4), and we got to discuss which we liked better (being easier to remember, makes more “sense”), or , and what was the connection between them. The extension question was: What do you think would be conserved if there were three objects? four? more?